What a nice surprise to open my email this morning and find that I was given this wonderful award by my dear friend and colleague Ron Berry, UnWriter. As with every award … comes great responsibility. 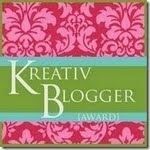 So, here are the rules to the Kreativ Blogger award (intentionally misspelled). I have NO idea what my natural hair color is. I eat no less than 12 raw egg whites a day (in protein shakes, of course). I have recently discovered I don’t like teenagers. I don’t like pets though I have a blind dog, two cats, and recently 4 kittens. I am learning the art of not worrying about tomorrow…and believe me, it’s an art. Now… the hard part. To find 7 bloggers to give this award to (that have not already received it). I’m going to reserve my last two nominations for a day or two. Alright, get busy with your lists. Congrats on the award and on having a wonderful “Kreativ” side. Aw, Kat!! Thanks!!!! I am in the middle of something right now, but I will get on this right away!!! I love ya sweetie.. thank you again.